Gryftec is a service and consulting company, specializing in embedded systems, microprocessor technologies and reprogrammable systems. The company operates as an engineering office, offering a wide range of services relating to the design, creation, implementation and testing of both complete systems and individual components related to embedded systems and microprocessor technologies. The GRYFTEC employees are experts in various fields of knowledge and technology used in microprocessor systems. 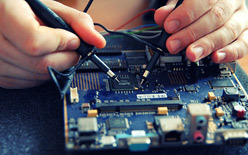 The company specializes in computer science and electronics, tightly focused on the use of these sciences in the creation and design of embedded systems or dedicated to them hardware and software tools. Our experience, tightly focused and specialized technical knowledge, competence, commitment and passion of our employees results in getting our customers the highest quality products. Our company is an example of the determination, persistence, hard work and shared commitment to allow you to create from scratch, without financial capital, an innovative company, specializing in modern technologies, operating on the market, still developing and implementing increasingly complex and technologically advanced projects.